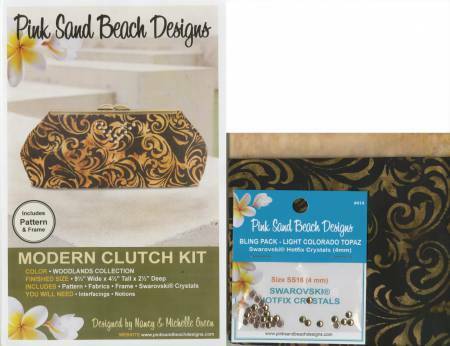 Each kit includes: Pattern, Frame, Batik fabrics, and Bling Pack of Swarovski crystals. (Interfacings are not included.) Kits are boxed in crystal clear boxes with security seals. The bag is fully lined with one pocket inside making it roomy enough for all the essentials including: iPhones, glasses, makeup, and ID cards. The frame is easily glued on making a fabulously finished clutch. This item will begin shipping December 17, 2018.